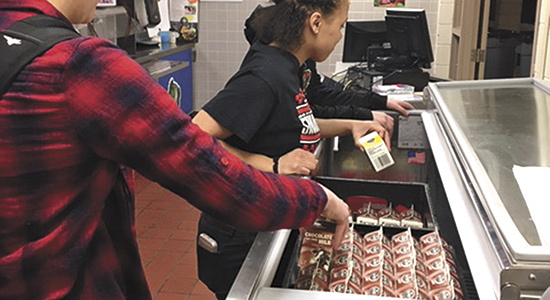 KIMBALL, Minn. – For the first time, students within the Kimball School District have quality milk available for them during food service hours. 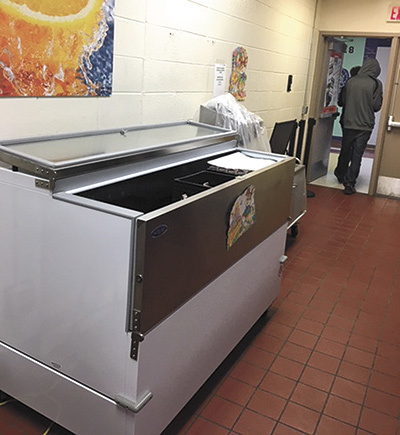 The district installed two milk coolers – one at the elementary and one at the high school – with funding from the Minnesota Department of Agriculture’s Agricultural Growth Research and Innovation Program’s Milk Cooler Grant. Hanson is the food service director with Taher Inc., a food service management company that provide lunches for students in grades kindergarten through 12 in the Kimball School District in Kimball, Minn. The district applied for the AGRI grant last fall and was notified of their acceptance Jan. 11. A month later, Hanson was able to purchase two coolers, with $3,000 of the total cost covered through grant funding. The elementary and secondary schools in Kimball were two of 38 schools and early education programs who received funding to encourage youth to consume more dairy with the installation of milk coolers. Place is the Minnesota Department of Agriculture assistant commissioner. One of AGRI’s missions is to facilitate farm to school programs, connecting children with local farmers and foods. After speaking with the program’s staff and area schools, a more specific purpose was established for the first round of the grant – to help fund the purchase of new equipment that would encourage more dairy consumption of local products. Many of the applicants and recipients of the milk cooler grant were smaller schools with perhaps tighter budgets. Previously, the Kimball School District was renting a milk cooler from their dairy contractor, Kemps. When Hanson and her district manager learned of the grant opportunity, they worked with the schools’ business manager and superintendent to apply. The coolers allowed the schools to meet the sanitation guidelines of the health inspector, as well as meet the satisfaction of their customers and provide a healthy option for the students. Each cooler stores 16 cases of milk, which is about 50 cartons per case, and allows for a smooth meal delivery service in a timely fashion, Hanson said. “It’s a healthier option during meal time, and by offering milk to the students, we can help support our local farms and farm to school project,” she said. Interest from Minnesota schools and childcare centers was overwhelming, so the department re-opened the funding opportunity this spring. The application closed April 5 with more than 125 proposals submitted for the $50,000 available. Within AGRI, about $13 million is available each year for grants. As needs emerge within the program, funds may be redistributed. While the recipients of round two have not been chosen yet, the applications are diverse, said MDA’s ag marketing and development grant specialist Lisa Sawyer. For example, more applicants requested milk coolers for their sports teams or coolers that do not require electricity and can provide milk, cheese and yogurt near the schools’ entrances and student lockers for breakfast or snack time options. In other instances, Place and her co-workers at MDA have visited early education centers and schools that have improved their farm to school programs with AGRI funding, and they look forward to seeing how schools increase dairy consumption with the milk cooler grant. “It’s always fun to connect with staff and students on the ground and see those success stories,” Place said.